K’lgaan/Klekane Conservancy is located on the east side of Princess Royal Channel, along the Inside Passage route. Klekane Conservancy shares its south and east boundaries with adjacent Q’altanaas/Aaltanhash Conservancy. This conservancy protects grizzly bears, salmon and marbled murrelets and low elevation Sitka spruce forests. It also provides a protected anchorage adjacent to the main Inside Passage route where visitors can spend a night to rest, fish or soak in a small hot springs. Special Feature: A bath house (8’ x 12’) with a concrete block pool (8 ’x 8’) is available so that park visitors may enjoy soaking in the warm and odorless hot springs water. The hot springs water comes out of a crevice in the granodiorite bedrock about 150 metres away from the bath house. It flows out at a rate of about 10.4 litres per minute. Water temperature at the source is about 53.2 degrees Celsius and about 41.3 degrees Celsius in the bath house. The hot springs water is not suitable for drinking. The hot springs bath house is located at the northeastern end of the estuary; about a 5 minute walk in at high tide and about 20 metres from a small stream. The UTM coordinates are: Zone 09U; 5899700 m North; 0521289 m east. K’lgaan/Klekane Conservancy is only accessible by boat or floatplane and is located about 45 km southeast of Hartley Bay, 65 km north of Klemtu and 90 km south of Kitimat. 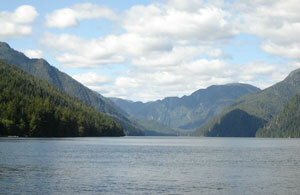 It is located along the east side of Princess Royal Channel (Inside Passage route), by Work Island. Reference: Marine Chart #3739 (Swanson Bay to Work Island). Reference: 1:50,000 scale Topographic Maps #103 H/2 (Butedale) and #103 H/7 (Ursula Channel). History: K’lgaan/Klekane Conservancy was designated as a conservancy on July 28, 2006 following recommendations from the Central Coast Land and Resource Management Plan. The hot springs building and pool were built prior to 2005 by unknown volunteers. There is an old diesel donkey engine on a wooden barge/skid on the shoreline about 400 metres north of Maskill Point. The UTM coordinates are: Zone 09U; 5893110 m North; 0522842 m East. Cultural Heritage: The conservancy is in the asserted traditional territory of the Gitga’at and Kitasoo First Nations. Use the below link for more information or to contact these First Nations. The conservancy contains two known archaeological sites (culturally modified trees) and has historically been used for traditional food gathering, fishing and trapping by local First Nations. Conservation: The conservancy protects an area of popular recreational use by boaters, the Klekane River watershed, all of Work Island and several small remote streams, lakes and wetlands. The conservancy also protects old-growth forests of red cedar, hemlock and spruce as well as coastal wildlife habitat including important salmon spawning streams and habitat for Black Bears. Wildlife: Black bears, wolves, waterfowl, eagles, spawning salmon and the occasional deer can be seen in the conservancy. The best place to see wildlife is at the river mouths and estuaries of Scow Bay and north end of Klekane Inlet. Humpback whales, killer whales, Dall’s porpoises, Pacific white-sided dolphins, sea lions and harbour seals can also be seen in the adjacent marine waters. There are opportunities to fish for trout and salmon in Klekane River. Please consult the appropriate non-tidal fishing regulations for more information. Anyone fishing or angling in British Columbia must have an appropriate license. This Conservancy is open to hunting during lawful hunting seasons but is closed to Grizzly Bear hunting. Please check the BC Hunting & Trapping Regulations Synopsis for more information. Black bears, wolves, waterfowl, eagles, spawning salmon and the occasional deer can be seen in the conservancy. The best place to see wildlife is at the river mouths and estuaries of Scow Bay and north end of Klekane Inlet. Humpback whales, killer whales, Dall’s porpoises, Pacific white-sided dolphins, sea lions and harbour seals can also be seen in the adjacent marine waters. Location: North end of Klekane Inlet, east side of estuary, about 10 km north of Butedale. Facilities: Cedar building (8’ x 12’) with green metal roof and a concrete block pool (8’ x 8’ x 3’deep). Comments: The waters are odorless. About a 5 minute walk in at high tide at the NE end of the estuary and about 20 m from a small side stream. Source of the hot springs is at 53° 14’ 50” North; 128° 40’ 50” West (53° C). Be aware of bears in the area.